The number one site for the Cavalier King Charles Spaniel breed in the UK. Welcome to our Breed Information Service. Firstly ensure that your garden is completely escape proof, puppies and older Cavaliers will find all the holes you have in the fence and can get caught in wrought iron gates. Consider putting plastic mesh over the bottom half of these types of gate. Take extra care if you have a garden pond. Make sure there are no electrical leads or cables in the area you intend for the puppy nor cupboard doors to be opened or surfaces low enough to jump on to. Many new owners start by confining the puppy to a Puppy Pen made of metal or plastic which is purchased in pieces that can be joined together to form a barrier within a particular room. This often helps initially to protect cupboard doors from being scratched or chewed. Most are from 4 feet square upwards. Allocate an area and a bed which are the Cavaliers own, an area in a kitchen or utility room is best if possible near to a door leading to the garden. As far as the bed is concerned the hard moulded plastic variety is easiest to keep clean and more resistant to chewing than the wicker type. Why not start with a cardboard box with one side cut down as an entrance with clean bedding, something old and warm or vet bed which is easy to wash.
Beware of staples, buttons and fasteners and anything else suitable for chewing in the bed area. Your Cavalier will also need its own water and feeding bowls, metal ones are safest and a small collar and lead. Not too expensive as they will soon need another stronger lead as they grow up. 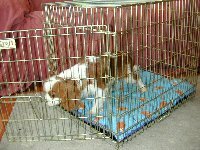 Another good tip is to use a Baby gate between the areas you wish to confine the puppy too and the rest of the house. Like babies a gate at the bottom of the stairs is also a good idea as young puppies should not be encouraged to jump up and down stairs on their weak young limbs. More owners now consider buying a collapsible metal cage ( minimum size 24" x 18" x 21" ) as the Cavaliers own house. This they find lovely as they can walk inside and feel secure with the open bars around them. We leave one erected all the time with the entrance open so the dogs can wander in and out. They have a wide variety of uses, as transport in the back of a car, going to the vets, on holiday in a hotel room and as a safe haven whenever the dog feels in need of one from visitors and their small children !